Delegates gather at the speaker's podium to discuss impeachment proceedings on Aug. 13, 2018. Speaker Pro Tempore John Overington is presiding over the House. Updated: August 14, 2018 at 1:05 a.m.
Delegates have rejected Article XV, which was proposed by Del. Michael Folk. The article targeted Justice Beth Walker for hiring outside counsel to write a court opinion. It was voted down on a 26-70 vote. Updated: August 13, 2018 at 11:55 p.m.
With the adoption of Article XIV, all four remaining justices on the state's high court have been impeached and are set to stand trial in the Senate. The article charges the justices of a lack of administrative oversight. The article passed on a 51-44 vote. Updated: August 13, 2018 at 7:20 p.m.
Delegates have adopted four consecutive articles targeting suspended Justice Allen Loughry. Article VII deals with the issue of the authorization of overpayment of senior status judges. That article passed on a 51-45 vote. Article VIII passed 96-0. That article states that Loughry used state vehicles for private use. Article IX also passed on a 96-0 vote. That article deals with Loughry's private use of state computers in his home. Article X passed on a 94-2 vote. That article states that Loughry lied under oath to the House Finance Committee during a budget presentation this past legislative session. Article XI, dealing with Loughry's framining of personal photos with state funds, was withdrawn and the House agreed to recess until 8:15 p.m. Updated: August 13, 2018 at 6:50 p.m.
Delegates quickly adopted Articles V and VI, which charge Justices Davis and Workman separately of authorizing the overpayment of senior status judges. Article V, targeting Davis, was adopted on a 61-35 vote. Workman was the subject of Article VI, which was adopted on a 63-34 vote. Updated: August 13, 2018 at 6:20 p.m.
After more than two and a half hours of debate, the House has adopted Article IV. The article charges Justices Davis and Workman of violating state code by authorizing the overpayment of senior status judges. The article was adopted on a 62-34 vote. With the adoption of Article IV, three of the four justices have been impeached. Updated: August 13, 2018 at 3:45 p.m. Article III, which relates to suspended Justice Allen Loughry's posession of the historic "Cass Gilbert" desk, has been adopted on a 97-0 vote. Updated: August 13, 2018 at 3:35 p.m. The House of Delegates has also adopted Article II, which targets Justice Robin Davis for her spending on court office renovations. Updates to her office cost approximately $500,000. The vote was 56-41. Del. Tom Fast proposed an amendment that would have recommended a "public censureship" by the Senate rather than Davis' removal from office. That amendment failed on a voice vote. The delgates are now considering Article III, which accuses suspended Justice Allen Loughry of taking the historic "Cass Gilbert" desk to his private home. The article also states that Loughry used state funds to transport the desk to his house. Updated: August 13, 2018 at 1:20 p.m.
After two hours of debating Article I of House Resolution 202, delegates have adopted the measure. The article targets suspended Justice Allen Loughry for lavish spending on office renovations. It was approved on a 64-33 vote. Debate focused on a lack of definition for "maladministration," as well as issues of separation of powers between branches of state government. The House has recessed until 2 p.m. -- when it will continue debate on the remaining articles. Updated: August 13, 2018 at 11:44 a.m.
After House Judiciary Chairman John Shott explained Article I as introduced, Del. Fast's amendment failed on a 5-91 vote. During debate, Fast called censureship -- in lieu of removal from office, if Loughry were to be convicted by the Senate -- a "statement of doom." Fast pointed out that the legislative branch currently does not control the court's budget. 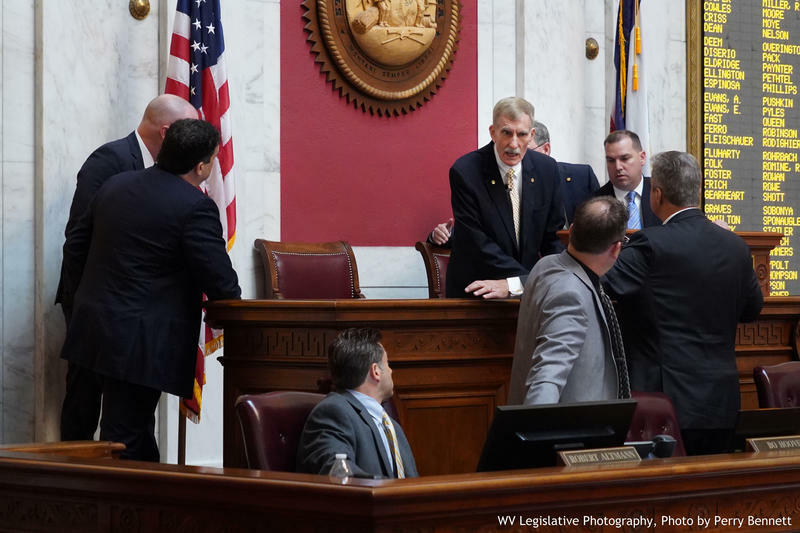 This November, West Virginia voters will decide whether the legislative branch will take control of the Supreme Court's budget by way of a constitutional amendment. Updated: August 13, 2018 at 11:18 a.m.
Del. Tom Fast, R-Fayette, has introduced an amendment to Article I, which targets suspended Justice Allen Loughry for lavish spending on office renovations, including the purchase of a nearly $32,000 couch and $34,000 floor inlay. Loughry's spending on renovations total approximately $363,000. Fast explained the amendment as it pertains to spending on "excessive spending of state funds" on court office renovations. Fast says this would apply to the other justices named in articles of impeachment. But, if adopted, the House would recommend censorship -- rather than removal from office. Updated: August 13, 2018 at 11:05 a.m. The House has returned to order and has formally introduced House Resolution 202, which contains the articles of impeachment adopted last week by the House Juidicary Committee. Each article of impeachment will be debated, amended and approved separately. Updated: August 13, 2018 at 10:14 a.m. The House of Delegates gaveled in and quickly decided to recess until 10:45 a.m. to review proposed amendments to the articles of impeachment.